NEW dockBoss air V2 Available Now! Last November we introduced a new addition to our dockBoss line of accessories that quickly became one of our most popular products. The dockBoss air has already helped thousands of people turn their old iPod speaker docks into great sounding, versatile wireless Bluetooth-enabled audio systems, and for that we are both thrilled and grateful. However, that did not make us complacent, and over time we identified some improvements which we thought could make the dockBoss air even better. Fast forward to today, where that list of desired improvements has culminated in the release of the NEW dockBoss air. We use an updated version of Bluetooth, which has allowed for increased audio quality and volume. We’ve also done away with the old “pairing code” that you used to have to enter to connect. Our new “1-click pairing” feature combined with a better indicator light and audio cues for power and device connection make using the dockBoss air even easier than before. And last but not least, the dockBoss air now supports remote functionality, so you can use your speaker dock’s remote control to play, pause, & skip tracks. All these new features plus a slick new form-factor means the dockBoss air has been improved in almost every single way. In our own (unshockingly bias) opinion, we think it’s the best wireless Bluetooth adapter on the market. We think you’ll agree, but don’t just take our word for it. Try for yourself and see. The NEW dockBoss air is available right now at our web-store at cablejive.com, and will be available here on Amazon.com shortly. dockBoss5 is the 5th release in our series of dockBoss adapters designed to make new iOS, Android and other devices compatible with the millions of iPod or iPhone docks that have flooded the market prior to the release of iPhone 5. It turns your old speaker dock into a universal charging and audio station in no time. It’s plug and play, simply connect your USB and audio cables of choice (or use the Micro USB and 1/8″ AUX cables included) and start getting the most out of that great sounding speaker dock you used to love using so much. Our dockBoss air has proven to be quite popular since it was launched two weeks back, and we’re truly thankful for the positive response. In an effort to help our customers get connected to their dockBoss airs more quickly and easily, we’ve put together a couple short videos showing you how to pair it with both Apple and Android devices via Bluetooth. You can find both videos on our dockBoss air product page, or view them below. Happy pairing! It’s a crazy day for us here at CableJive, as we launch our biggest non-cable product yet, the dockBoss air. Those familiar with our dockBoss line of products know that they’re designed to help expand the compatibility of 30-pin iPod speaker docks to connect with a wider range of devices, and it’s with the dockBoss air that we take that concept to its true (and logical) next level. 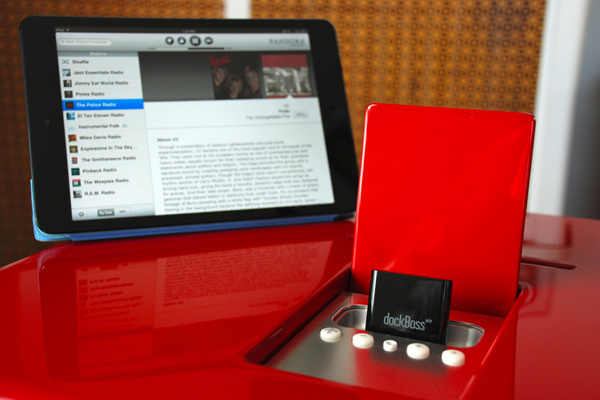 dockBoss air is a small adapter that connectes any Bluetooth-enabled audio device to your iPod speaker docks and systems, allowing you to stream HiFi audio wirelessly. It pairs with your devices quickly and easily so connecting to your systems is as simple as being in range. It’s powered by the docking station / system itself, so no need for chargers or batteries. Perfect for Android, Blackberry, Windows Phone, or new lightning-equipped iDevice users looking to get a working speaker dock for their audio players, or classic iPod, iPad, & iPhone users just looking to go wireless. 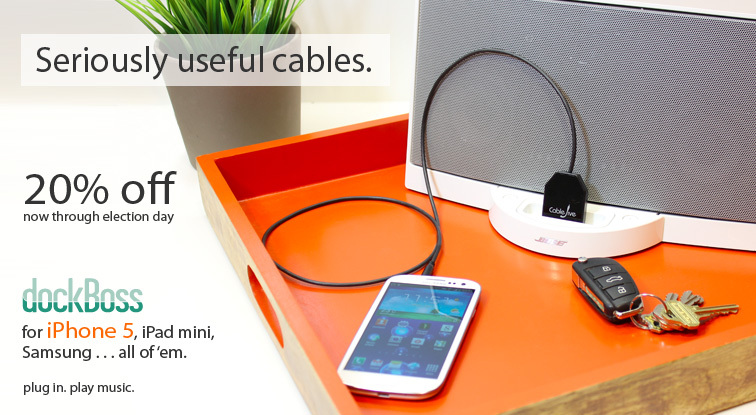 Not to mention streaming audio from your PC, tablet, or laptop. Plus, if you have an AUX input in your car, you can pair it with our +USB Line Out Dock Cable and a USB car charger like our dualCarCharge and instantly add Bluetooth wireless audio to your car! 20% Off dockBoss Now Thru Election Day! Democrat or Republican? iOS or Android? Maybe you’re an independent? Maybe you still use a Blackberry? We don’t judge. We want to give you MORE options this election season. We want to make your life easier. And we want to save you money! Power to the people! Campaign speeches aside, you have enough to worry about this election season. Why worry about that great, expensive iPod speaker dock of your’s becoming obsolete? With our dockBoss cable, you can play audio from ANY device that has a headphone/minijack port through your favorite iPod speaker dock or system. Use your Android, Blackberry, Windows phone or tablet, Lightning-equipped iDevice, Laptop, or whatever else you use to play music with one of the many incredible 30-pin iPod speaker docks on the market today. And now through Election Day, November 6th, you can get 20% off our dockBoss cables by using the coupon code boss12, or by clicking here. If you want more choices, more freedom, and you want to save some money too, go dockBoss, and go now! Find (or borrow) an iPod or iPhone and connect it to your system. 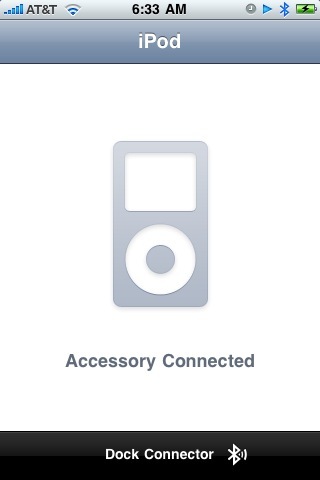 If upon connecting, the iPod/iPhone gets locked onto a screen that reads “accessory connected” or something similar (see example on right), and you find yourself unable to use the controls on the iPod/iPhone, there’s a good chance the dockBoss won’t work for you. Here’s why: Systems that lock an iPod or iPhone’s screen and control mechanism use a digital audio interface, which specifically requires an iPod or iPhone to be connected. These systems are custom-built, with elements like control, data, playlists, etc., all deeply ingrained in their own unique software. It isn’t simply good enough to “trick” those systems into thinking an iPod is connected because they actually require the ability to continuously communicate with an iDevice on a system-specific level. If you find that your system does not lock the iPod/iPhone’s screen and controls, then there’s a good chance a dockBoss cable WILL work for you. These systems use an analog audio interface, which generally jives quite well with dockBoss cables, allowing you to listen to whatever your heart desires from your favorite non-iDevice. dockBoss+ Now Available w/ Female USB & Audio Connectors! Our dockBoss+ cable has made it possible for thousands of of users connect non-Apple devices to their favorite iPod docks and speaker systems; allowing them to listen to audio AND charge where it was not possible before. Its Micro USB connector is compatible with hundreds of the latest gadgets, but it certainly doesn’t cover everybody. What if you need a longer audio connection? Or even worse, what if your device doesn’t utilize a Micro USB connector? Starting today, don’t worry about it. Due to popular demand, we’ve added a new version of our hit dockBoss+ cable that provides a female standard USB connector for charging, and a female 3.5mm audio port. And, it’s available right now! Use any length AUX cable you want to get the audio connection that works for you, and use whichever USB-based power cable that came with your device to charge it. Now, no mater what mobile device you use, you can truly be the boss of your dock! NEW dockXtender Premium Available Now! Don’t Miss CableJive’s Biggest Sale Ever! Christmas Is Coming! Order Your Gifts Now! 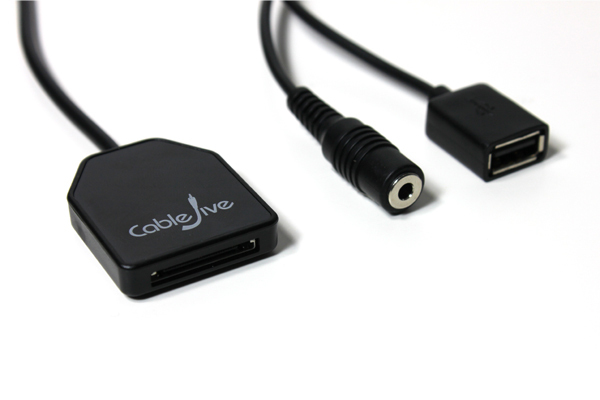 CableJive’s 2016 Black Friday Sale Starts Now!